Prime Minister Ehud Olmert renewed his opposition to peace talks with Syria, describing recent peace overtures by Syrian President Bashar Assad as false pretenses. Have we not learned a thing? "Syria continues to support terror in Iraq, is collaborating with the Iranian President and is sparing no effort to topple the government of (Lebanese Prime Minister Fouad) Siniora," Olmert said during a joint press conference with his Norwegian counterpart Jens Stoltenberg in Jerusalem. "We want to achieve peace with every state, peace we want – but false pretenses we are not ready to accept," he said. Olmert said Israel doubts the seriousness of Assad's readiness to talk peace with Israel because of its ongoing interference in Lebanon where it is seeking to create "chaos" by strengthening its ally Hizbullah. "We see Syria continuing to support the most extreme and violent terror against the state of Israel," charging that Damascus's support for Hamas leader Khaled Mashaal has hindered talks over the release of Gilad Shalit in exchange for hundreds of Palestinian prisoners. Turning his attention to the Palestinian front, Olmert expressed his readiness to meet with President Mahmoud Abbas as soon as possible. "I hear that Abu Mazen (Abbas) will be happy to hold a meeting with me. If it is possible to make him and myself happy, I see no reason not to do so, and I hope this will happen very soon," he said. Speaking about the ceasefire between Israel and Palestinian armed groups in the Gaza Strip, Olmert said that Israel's restraint to ongoing violations of the ceasefire in the form of rocket attacks at southern Israeli cities will soon end. "Over 40 rockets landed in Israel since the ceasefire and the last one was fired as we speak," Olmert said referring to a Qassam rocket fired from the northern Gaza Strip at the western Negev by Islamic Jihad gunmen. Olmert met with King Abdullah of Jordan on Tuesday in Amman and discussed the long-stalled peace talks with the Palestinians. Olmert's office issued a laconic report on the meeting, only saying that "the two leaders discussed the situation in the Palestinian Authority, agreeing to meet again and strengthen ties between Israel and Jordan." Olmert described his meeting with Abdullah as "friendly" and said he discussed the Red Sea-Dead Sea Canal Project with the King. The project aims at building a canal to funnel water from the Red Sea to the Dead Sea, and to set up a desalination plant to produce potable war for Jordanians and Israelis living in the Jordan Valley area. Stoltenberg voiced his support for Israel's right to live within secure borders and the demands imposed on Hamas by the international community. He Oslo's concern over Iran's nuclear program and condemned President Mahmoud Ahamadinejad's hosting of a Holocaust denial conference in Tehran last week. 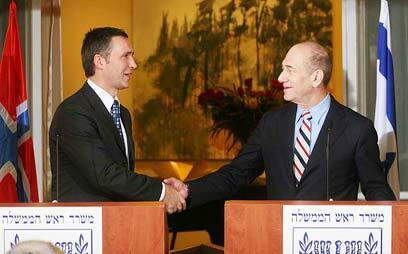 See all talkbacks "Olmert: Syrian peace overtures not genuine"